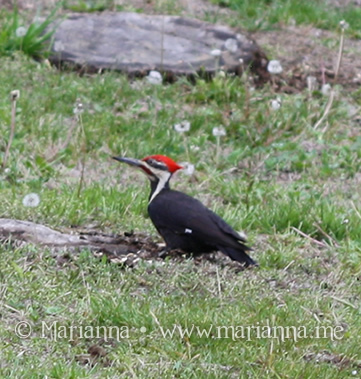 We have had quite a few visits from this big woodpecker this Spring. He enjoys munching on the tree stumps in the front yard. Oh my, he's a pretty boy! Oooo, He's cool! I've seen these a few times and they are huge, great shot! That's a pileated woodpecker. They have a very loud unique call that I hear in our woods quite often. They are amazing to watch; their head looks like a jackhammer when they are tearing apart a dead tree looking for bugs with pieces of wood flying every where. Woody! What a handsome bird! Oh man, I hope he doesn't show up super early in the morning, lol. He's a handsome fellow though. I have a pileated in my neighborhood -- he comes to visit the feeder every once in a while. Nice shot. I've never seen a woodpecker up close before, hope he's not too noisy! That bit of red on his head is pretty awesome. I'm not sure I've ever seen a woodpecker! What a pretty bird, I don't think I've ever seen one, aside from the cartoon! Great shot! Bryson has started watching the show lately. Woodpeckers are so cute, I think. I remember watching one chase off a squirrel over and over again one day in the woods. Hilarious. What a great shot. He's beautiful! Wow, such a pretty bird! I don't think I've ever seen one in person. Beautiful!! And I used to love that cartoon! Pileated woodpeckers are simply magnificent. I have only seen one a couple of times in our area. How fortunate you are to have him visit regularly. We used to have a couple that lived by our house up north. I miss it. They are beautiful and majestic! What a neat bird. I took a couple pictures last month of 2 neat birds too! OH how neat to capture a picture of one, we have a couple,I hear them often but never have I seen it to capture a picture! Love this picture. Beautiful! We saw a nest for them in Florida, but no birds.